To help Arabic learners with the pronunciation of the letters and sounds of the Arabic alphabet I have developed the Arabic Letters App. To add to this resource, I have compiled a number of useful videos from YouTube that show how to pronounce each letter. Please take a look for yourself and tell me if you find this helpful. 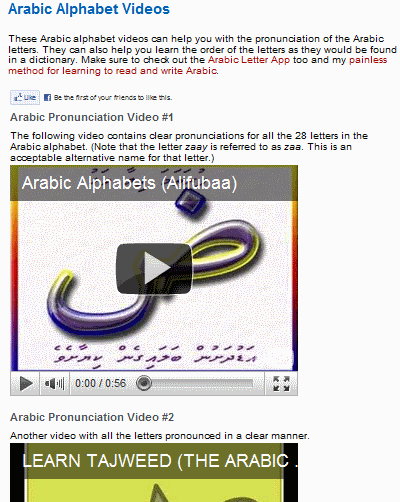 This entry was posted in Learning Arabic and tagged arabic alphabet, arabic letters, arabic pronunciation, videos by ArabicGenie. Bookmark the permalink.